I am trying to get my 1910 back to original condition. I have removed the modern Anderson timer and timing cover. I purchased a 2 piece timer and ordered a 1910 timing cover. After analyzing the parts I have discovered that the roll pin hole is not in the correct spot on the cam shaft. What do I need to do? Does the collar outside the timing gear come off? Is there a different cam shaft for the 1910? When I went from a 2 piece timer to a one piece timer I had no such issue so I can't understand why you would have a problem going the other way. As long as the location of the roller for the two piece timer is reasonably close to the position of the roller for the one piece timer I would expect that you can rotate the timer housing enough to make up any difference You will definitely have to check the timing and adjust the timing rod with the 2 piece timer installed and if your cam shaft is drilled through make sure you don't have the roller 180 degrees out. I would replace the fiber cam gear while you have things torn down to the point you're at. Rod, be advised that the 2.5" dimension for location of the timer rod does not work for the early timer. The timer rod is also bent in the opposite direction at the 90 deg. bend. (faces the firewall)) Time the engine by piston travel, set the timer to fire on #1 and bend the rod to suit. Note that the timer is automatically concentric to the camshaft and the roller assembly is what retains the timer housing. It is not dependent on the front cover as is the case in later years. Could be a simple as the fiber type gear is thicker at the center then an original gear. You could also file the slot a little deeper. The pin only keeps the roller from turning on the cam, the cap keeps it in place. I have a friend that is restoring a 1911 torpedo. It is open valve and has a two piece timer.The two piece timer with a roller would not work to well. The two piece is a repro. He changed the roller to the Anderson parts and is runs well now. Send me a email and I will give you his phone no, and email. He will tell you what he did. it sounds good,and looks good with the two piece timer. Does the timing gear simply pull off? I don't want to damage anything. I found my own answer. Snyder's part # T-3050 is a different timing gear retainer for the early T's. I will buy the bronze timing gear. Thanks all. Another trap for Model T experts. The two piece and one piece timer both required a different front engine gear case cover. In my advancing age I have forgotten the details, but I asked John Regan who knows the complete details to provide some help and he will post here. The two piece timer works excellent when mated with the correct parts, no so well when mismatched. Few people understand the difference. Be patient for John's reply. Actually Ron the "problem" is when going the other way namely trying to use an early timing cover and a later timer. I will warn about one thing. For a time there was marketed a repro 1910/1911 timing cover that was in fact only for 1911 but the maker thought the thing could be used for 1910 too if he supplied the cover with a cutoff stud sticking up that was claimed to hold the fan belt tension spring by sliding up inside of it. That will not work because there isn't enough room for the spring to operate in at all. It was never the way it was done on 1910 T's. The true 1910 timing cover that can use the spring has a "well" for the spring to sit down into and it is lower than the threaded boss that the 1911 cover has. 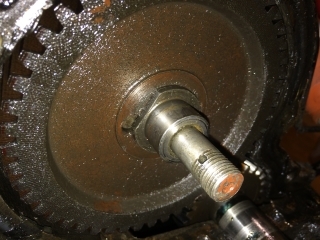 The threaded boss is for the tension bolt that was used to tension the fan belt in 1911. 2 different covers - true 1910 cover has a spring "well" made from a casting "pocket" at the front of the timing cover. 1911 cover has a threaded boss and did not use a spring. I make the 1910 spring and have the factory drawing for it if you need one. The early timers had a lot going for them and I am not sure Ford did us a big favor by changing over to the later one that needs alignment jig to get it right. Having the timer held in place by the cam keeps it perfectly centered if designed correctly with no real assembly error causing timing error. I purchased Lang's pn 3009 timing cover. It looks like it has the well and not the stud for the tension spring. I will let you all know how the project goes in the next few days. Thanks all. I talked to Don Lang extensively about the 10 versus 11 cover when he was talking about it being made and they had the factory drawing. I am confident you are on the right path. When did the change in the '10 to '11 timing cover take place? Which change? I don't mean to be flippant but there were lots of changes going on every few weeks or months on the various parts. Ford never really referred to the covers by year as 10 or 11 but rather just used factory numbers. Factory number 403B had the fan spring well that was discussed and the newer design 403C used the threaded boss which we commonly refer to as the 1911 version. 403C was first drawn up on July 27, 1910 but that does NOT mean that it was then in production and on cars beginning that day. July is roughly a typical date for a new feature to first be drawn up that then appears on cars that WE refer to by the following model year. For instance July of 1911 might begin to have drawings for a lot of things we call "1912" items. This is not a hard and fast rule but just an observation that I noticed during my own research at the archives. I was referring to the change from "spring well" to "threaded boss" as discussed above. Thank you for the clarification.